Prior to the advent of modern, synthetic insecticides, European red mites (ERM) were not considered a significant pest of tree fruits. ERM are what entomologists call a “secondary pest,” which means that they generally only became a pest in response to some action by people. Synthetic insecticides provided excellent control of pests such as codling moth but also killed the natural enemies that previously had kept ERM at sub-economic levels. However, predatory mites still play an important role in the management of ERM (See “Biological Control”). 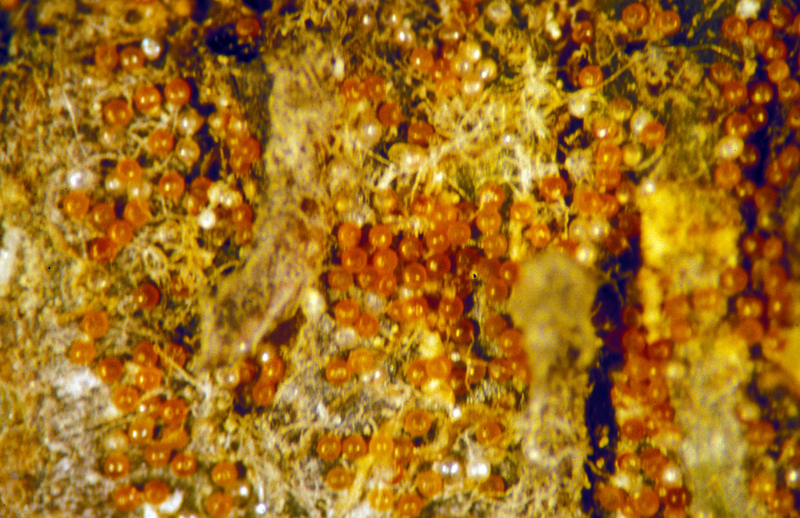 European red mites overwinter as eggs in the bark around the base of buds and spurs. The overwintering eggs are reddish-orange, round or slightly flattened, and have a slender stalk on the top (Fig. 1). Eggs produced during the growing season are yellowish, round, have no stalk, and are laid on the underside of leaves (Fig. 2). Egg hatch begins in the spring around the tight cluster stage of apple development. The newly hatched larvae are yellowish and have only six legs. 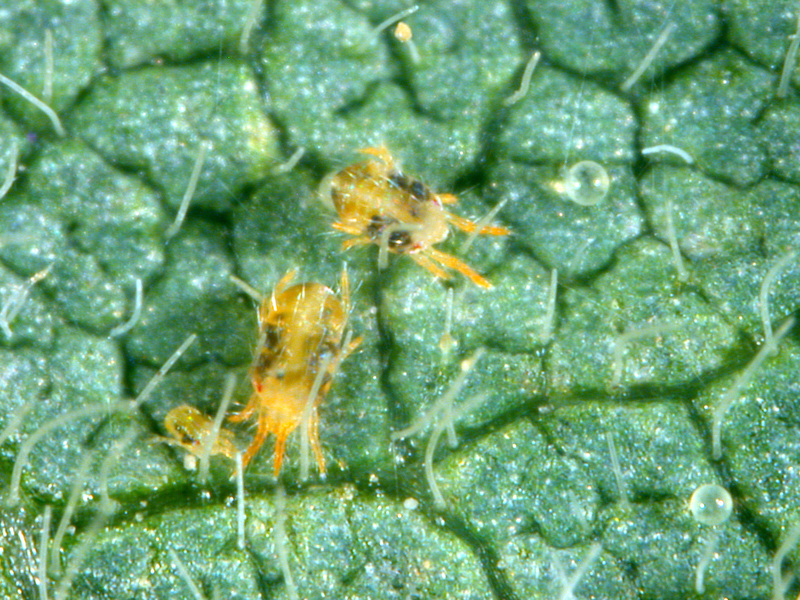 The mites go through two additional juvenile stages (nymphs), each a little larger than the previous stage, and these have eight legs. 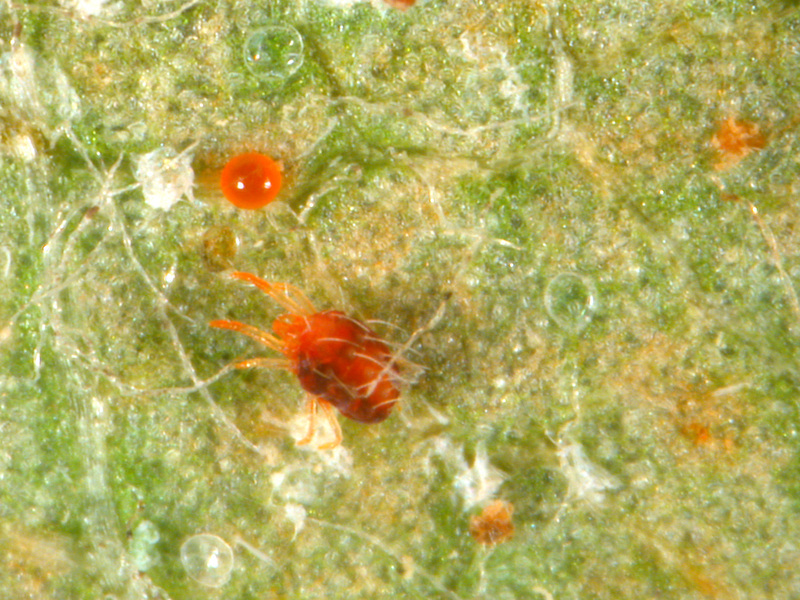 Adult female mites are bright red, with noticeable white spots at the base of 6-8 hairs on their back (Fig. 3). The adult males are dull green to yellowish brown, have a pointed abdomen, and are much smaller than the females. Fig. 3. European red mite adult female. Development from egg to adult can take from 1 to 3 weeks and is temperature dependent. In hot weather, mite populations can build up very quickly. There may be 6 to 8 overlapping generations each year, so all life stages may be present simultaneously. Females each lay about 20 eggs, with the first summer eggs being laid around late petal fall. Fig. 5. Trees with severe ERM damage. Fig. 6. 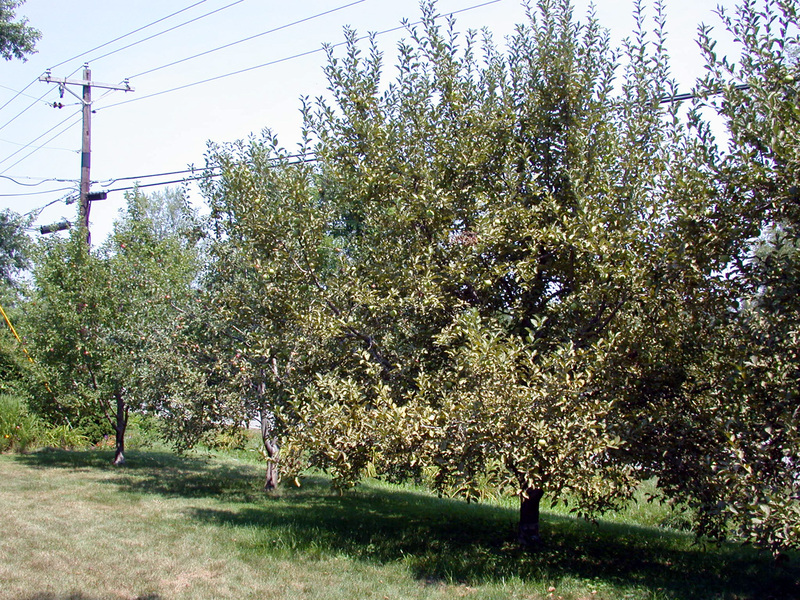 Apple trees in early August with leaves dropping. 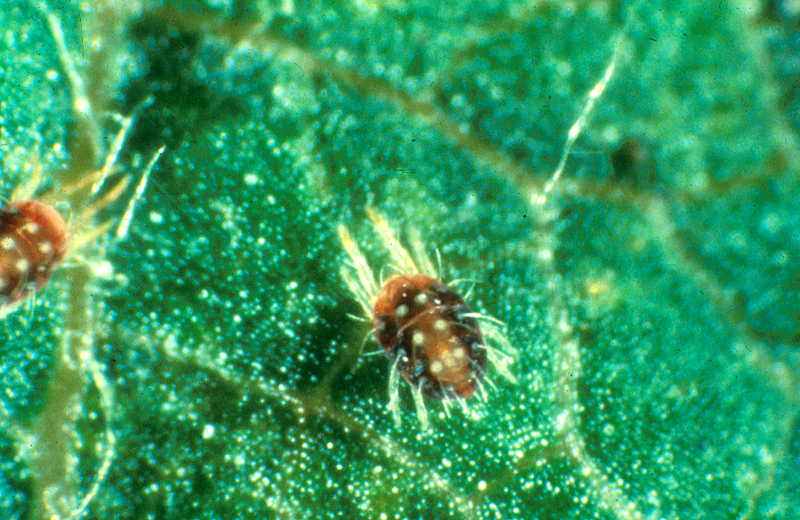 European red mites feed by inserting their mouthparts into individual cells of apple leaves and withdrawing juices from the cell, including the chlorophyll (Video 1). If there is sufficient feeding, the leaves may take on a bronze appearance by mid-July. Serious feeding injury can result in poor fruit color and reduced size and quality in that year’s crop, as well as reducing the number of fruit buds for the next season’s crop (Figs 4-5, and Video 2). When ERM populations are extremely high (~100 per leaf), premature leaf drop may occur, as early as late July or early August (Fig. 6). It is often difficult to accurately gauge the severity of the damage from mite feeding because the response depends on the overall vigor of the tree. In general, it is a good idea to maintain populations below the treatment thresholds. Some varieties, such as Red Delicious, Northern Spy, and Rome, are more likely to have ERM infestations than others. Conserving natural enemies is the key to management of ERM. If you choose insecticides wisely, outbreaks of ERM will be infrequent and can usually be cleared up fairly easily with the miticides currently available. However, if you kill most of your predator mites by choosing highly toxic insecticides, you may have a very difficult time getting ERM under control, requiring multiple applications of expensive miticides. Organic growers rarely have problems with ERM because the pest control materials they use tend to be relatively non-toxic to predatory mites. In Indiana, the primary biological control agent on ERM is the predatory mite, Amblyseius fallacis (Fib. 7, Video 3). Other predatory mites, Agistemis fleschneri and Zetzellia mali, may be present in lower numbers (Fig. 8-9). In addition, there is a small, black lady beetle, Stethorus punctum, that may be found feeding on mites, especially late in the season. A number of insecticides used on apples have a detrimental effect on Amblyseius fallacis. Table 1 summarizes the level of toxicity of commonly used apple insecticides on this predatory mite. You should choose the least toxic alternative whenever possible to conserve the predatory mites in the orchard. Figure 7. Two Amblyseius fallacis feeding on ERM. Fig 9. Zetzellia mali, a predator mite. Table 1. Toxicity of apple insecticides on predatory mites, especially Amblyseius fallacis. 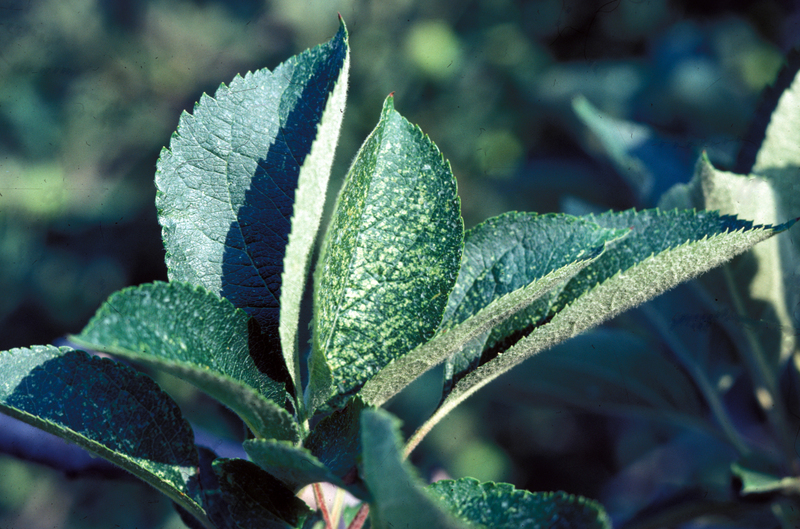 Most growers know what areas of their orchard are prone to mite infestations. It may be in a block of Red Delicious trees, near a gravel road, or in some other location. If you know where they usually show up first, concentrate your early scouting efforts there. Otherwise, Red Delicious trees are usually a good place to start. You should scout weekly from just after petal fall until August, or until populations are below 10 mites per leaf after August 1. Pick four leaves from each of five trees. The leaves should come from different sides of the trees, some high, some low, some on the exterior of the tree, and some from interior leaves. Use a hand lens (at least 10X) to look for mites on the underside of the leaves. Count all the stages that move, anything except eggs. Table 2 shows the treatment thresholds for different times of the growing season. Table 2. Treatment thresholds for European red mites on apples. Trees become more tolerant of feeding damage as the season progresses. After August 1, as soon as mites are under control (below 10 mites per leaf), you can stop sampling for the season. If you find mites above the treatment threshold in the first area you sample, you should look at other parts of your orchard. Often you will not need to treat the entire orchard. 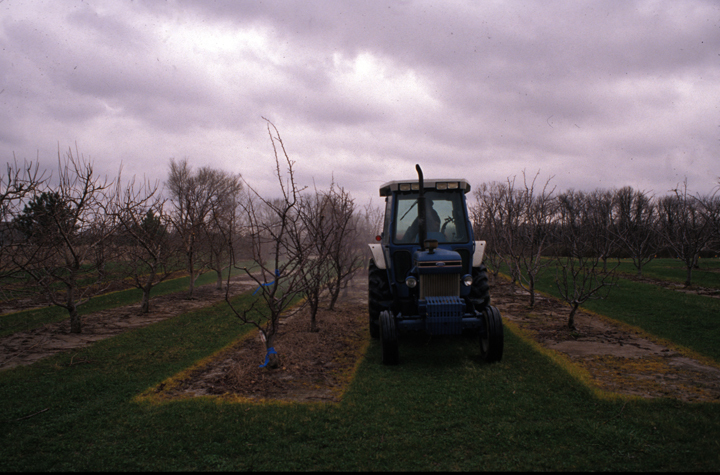 If you find that only part of your orchard is above threshold, you should treat a few additional rows past the edge of the infestation. Good coverage with a superior oil spray prior to bloom is an important ERM management strategy that all growers should use (Fig. 10). This application is a good management practice een if populations were low the previous year. The oil application coats the eggs, preventing the exchange of gasses through the egg shell, suffocating the embryo within the egg shell. The closer to ERM egg hatch (tight cluster) you make the application, the better control will be because the embryos are respiring more rapidly as they prepare to hatch from the eggs. Superior oil applications also control some aphids and scales. Oil should be applied only when temperatures are above 45oF and never just before or after freezing weather. Superior oil applications after bloom will likely cause phytotoxicity. There are also several more highly refined oils that can be applied during the growing season that will control ERM. These oils function in the same way as superior oils, suffocating the mites, so good coverage is a must. These oils have no residual activity. If they do not land on the mite, they will have no effect. Predatory mites have the ability to climb out of the oil on the leaves and to clean the oil from their body, so they are not as adversely affected by oil applications. Fig. 10. Superior oil application. There are a number of miticides available for use on apples. These fall into two general categories, preventive miticides, which are applied before mite problems and rescue miticides, which are applied when scouting indicates ERM populations have exceeded the treatment threshold. ERM have shown the ability to develop resistance to a number of miticides. Generally speaking, resistance occurs when a single miticide or related group of miticides are used repeatedly. Each miticide has a particular mode of action (MOA). One way of avoiding resistance is to rotate between products having different MOA. For purposes of avoiding resistance, miticides with the same MOA should be considered the same miticide. For example, Apollo and Savey are different products, but they have the same MOA. So, if you repeatedly use one of these products and resistance develops, the mites would also be resistant to the other product. Table 3 lists each miticide, its MOA group, use category, and ERM control rating. To avoid resistance, rotate between products in different groups. If you are going to use Agri-Mek, Apollo, or Savey as preventive treatments, apply at petal fall or first cover. You can use Zeal either as a preventive or rescue treatment. If using Zeal as a rescue treatment, you should apply it when populations reach a threshold of 1-2 mites per leaf. Zeal is most effective on eggs and larvae and is not a good choice as a rescue treatment when populations are already high. Rescue treatments should be applied when populations exceed the treatment thresholds. Table 3. Miticides labeled for use on apples, mode of action (MOA) groups, use categories, and level of control of European red mites. 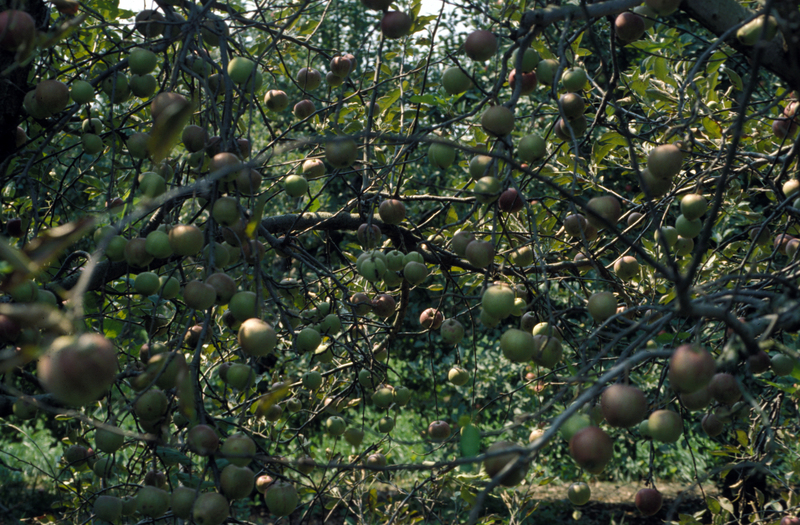 *See ID-465 “Midwest Fruit Pest Management Guide" <https://ag.purdue.edu/Hort/Documents/ID465.pdf>. Brown marmorated stink bug (BMSB) is an invasive pest that was detected first in Indiana in Elkhart County in November 2010. Since that time, it has spread to all corners of the state, and is probably present everywhere in Indiana. When invading a new region, BMSB typically will first become a household pest since it likes to overwinter inside homes to avoid our cold winters. Later, it will become a pest of fruits, vegetables, ornamental plants, corn and soybeans. Over the past several years, we have had sporadic reports of damage to various crops such as soybeans, sweet corn, and tomatoes, although in most cases, the damage was not severe. Now, for the first time, we have significant losses in a fruit crop, in this case apple. One northern Indiana grower reported losses up to 30% in some blocks of late maturing apples in 2016. Based on the experiences of growers on the eastern seaboard, there is potential for even greater losses in the next few years. BMSB is capable of causing such significant losses that growers will need to do whatever is necessary to protect their crops, even if it means using products that will kill predator mites and potentially flare ERM populations. So, how does this change in pesticide use affect our European red mite management program? Here are some suggestions. Monitor your crops for BMSB. Don’t spray unless you have some evidence that they are there. You can use various types of traps or just direct observations to determine their presence. Protect your crop from BMSB and we will deal with the consequences (ERM) later. It is most likely that sprays applied to control BMSB will usually be after we have stopped worrying about ERM for that season, so no action will be necessary for ERM. The next spring, if possible, apply a Superior oil spray. If you are using captan prior to bloom, you will not want to apply oil. If you have sprayed for BMSB the previous year, you should seriously consider the use of one of the preventive miticides, such as Apollo, Savey, Agri-Mek, or Zeal on the blocks you sprayed for BMSB. Beginning shortly after petal fall, begin scouting for ERM in the blocks that you sprayed for BMSB last year or where you would normally expect to see ERM first. Follow the spray threshold guidelines and treat with a rescue miticide if you exceed the threshold. Given the loss of predatory mites, you may need to apply more than one rescue miticide. If more than one application is necessary, choose a miticide with a different mode of action to avoid the development of resistance. The use of superior oils and conserving natural enemies must be included in a resistance management program. Using these management strategies will reduce ERM populations, either lessening the need for miticide applications or making it more likely that the miticides will provide acceptable levels of control. Just as important, oils and predators will eliminate resistant and susceptible mites alike. See Fig. 11 for a summary of the steps involved in European red mite management. Fig. 11. Mite Management Flow Chart. 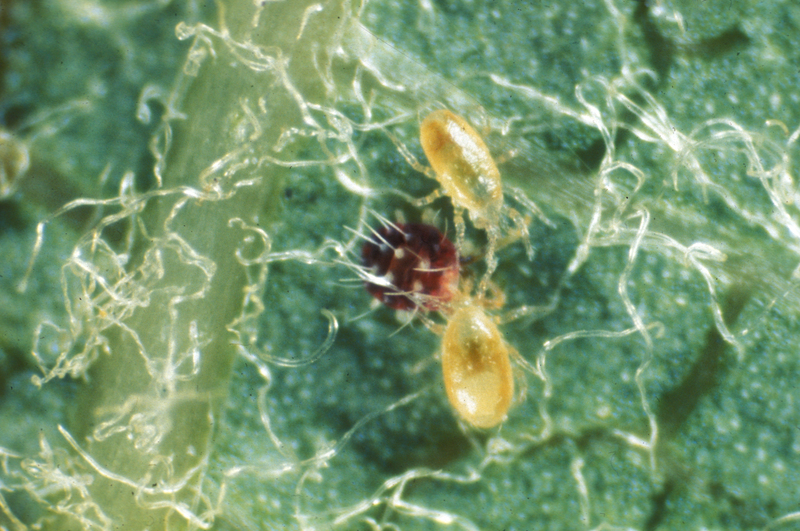 There are two additional pest mites that growers may see in their apple orchards. 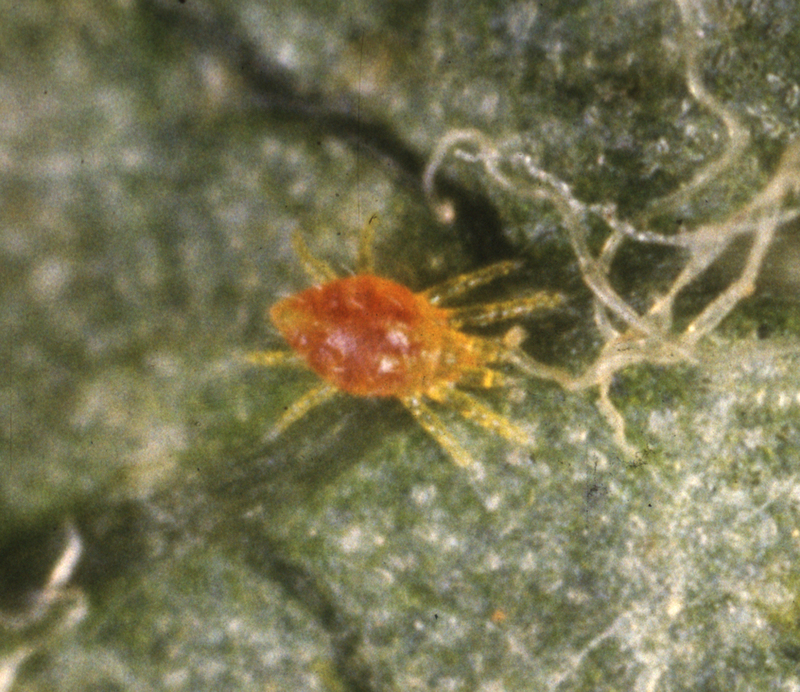 The twospotted spider mite is a pest of many crops, especially in hot, dry weather. It is much less common in apples than ERM (Fig. 12, Video 4). When scouting for ERM, count twospotted spider mites just as you would ERM in making treatment decisions. Acramite, Apollo, Envidor, Kanemite, Portal, Savey, and Zeal all provide good to excellent control of twospotted spider mites. Apple rust mites are very small, wedge-shaped mites that can occur in very large numbers in apple orchards (Fig. 13). It is generally assumed that populations must reach 200 per leaf before treatment is justified. 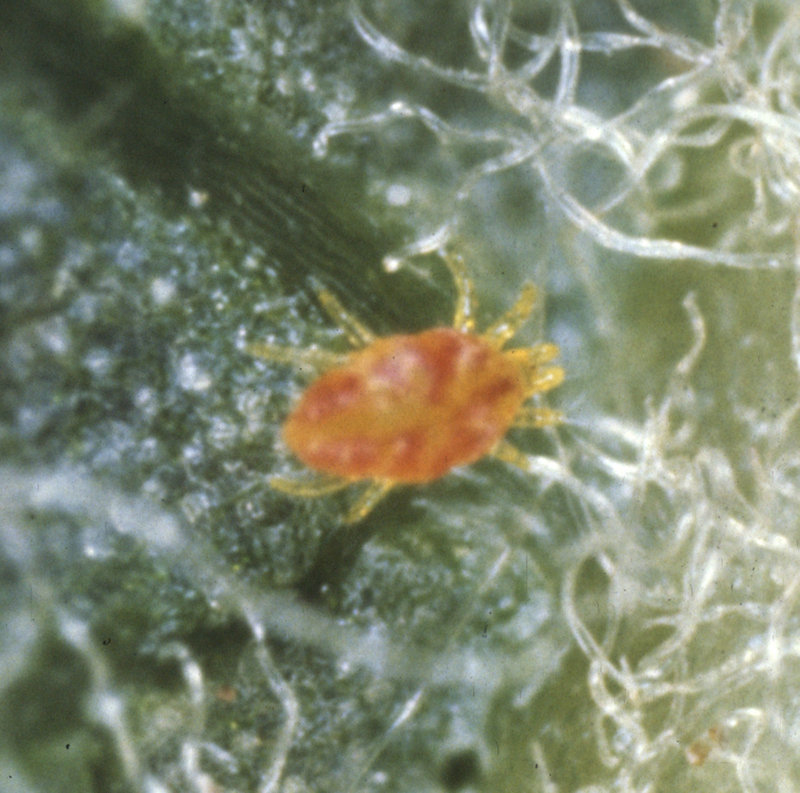 In most cases, apple rust mites can be considered beneficial because they serve as an alternate food source for Amblyseius fallacis before ERM start hatching. This allows predatory mites to build up before the ERM become numerous. Although it is unlikely you would ever want to treat for apple rust mites, you can achieve good to excellent control with Acramite, Agri-Mek, Envidor, Kanemite, Nexter, and Portal. Fig. 12. Two spotted spider mites and eggs.